The University of New Mexico will be howling as it celebrates its 90th annual Homecoming festivities this year to welcome back alumni and the campus community as it features “Homecoming 2014: Howling@125,” through Saturday, Sept. 27. More than 50 separate events, most held on campus and free to all, will take place during the fun-filled week. The celebration is highlighted on Friday, Sept. 26 at 6 p.m. when the Lobos take on Fresno State at University Stadium, including the coronation of the Homecoming king and queen during halftime of the tradition-rich football game. 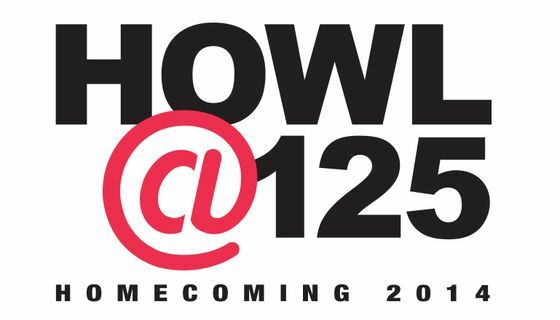 This year’s Homecoming football game will be broadcast on either ESPN or ESPN2, which prompted a few schedule changes to accommodate all the festivities. “The schedule change has created a few challenges in rearranging traditional homecoming events, but has also provided us with new opportunities to try something new,” said Sue MacEachen, UNM Alumni Association program director. To celebrate UNM’s 125th Anniversary, a 60-minute documentary will be aired at a red carpet movie premiere on Tuesday, Sept. 23, 5:30 p.m. at the National Hispanic Cultural Center, 1701 4th St. SW. The public is invited, but reservations are required at, Homecoming 2014: HOWL@125. The annual Campus Decorating Contest should once again get the campus community into the spirit of the week with campus-wide poster and short video competitions. Decorated posters must be delivered to the SUB Ballrooms A&B at 10:30 a.m. on Wednesday, Sept. 24, where they’ll be displayed. Judging will take place online and also at the Alumni Faculty and Staff luncheon also on Sept. 24. For more information including entry details and important dates to remember, visit: Homecoming decorating contest. It’ll be Lobo Spirit Day on Thursday, Sept. 25. Faculty, staff and students are encouraged to wear red on campus to show off their Lobo pride. All are encouraged to join students for a pep rally at noon in the SUB Atrium at the UNM Student Union Building to help send the Lobo teams to victory. On Thursday night from 5:30 to 8 p.m., the UNM Alumni Association hosts an open house and book-signing featuring prominent alumnus Ed Lewis, ‘63. Lewis co-founded Essence Communications and created one of the country's largest African American multi-media organizations. He continues to break new ground with Latina, the first lifestyle magazine for U.S. Hispanic women. Also featured will be the homecoming poster artist, William C. Hook ’71, who also has a new book featuring his works through time. Special reunions in attendance at Hodgin Hall include the Honors College, Earth & Planetary Sciences, Veterans Alumni, School of Engineering and Young Alumni. The event will be held at Hodgin Hall. All alumni are invited. Due to the schedule changes, this year’s silent auction will be coupled with the open house on Thursday. The auction will be open from 5:30 to 7:30 p.m. and will include featured items such as: a Dallas Cowboys vs. Arizona Cardinals game package complete with hotel, restaurant and Dallas fan gear; a Disneyland Destination Package including a four-pack hopper pass with hotel, restaurant and more; a Colorado Rockies baseball game VIP experience with lodging; and a private wine tasting for 20 of your closest family and friends from Total Wine; and many other items include exclusive golf packages; tickets to special attractions in and around Albuquerque, beauty and spa packages, balloon rides, art, pottery and jewelry, and of course, Lobo gear. An online auction will also be held throughout the week featuring items including: RC Gorman giclee, ski and golf packages, Lobo gear and more. The UNM Health Sciences Center will host an open house on Friday, Sept. 27 from 10 a.m. to 12 p.m. as part of the School of Medicine’s 50th Anniversary Celebration. A variety of tours will be held throughout the day. For more information visit, UNM HSC. On game day Friday, the UNM Alumni Tailgate begins at 3 p.m. in the West Lot located on the northwest corner of University Stadium. The largest fan tailgate will feature live entertainment, spirit giveaways and microbrew beer tasting (21 and over). If you’re coming from work and need a quick bite, stop by for a light $5 meal before you head into the game. The fun doesn’t end with the football game on Friday night. On Saturday, Sept. 27, the UNM Alumni Association will present the Zia & Lobo Awards and the Young Alumni Inspirational Award honoring prominent alumni. The recipients include: Tim Cass, Lobo Award; John Draper, Charles Lanier, Damon Martinez, Don Power, Ruth Schifani and Barbara Vigil, Zia Award; and Michael Chicarelli, Inspirational Young Alumnus. The All-University Breakfast will be held at 9 a.m. at the Hotel Albuquerque located at 800 Rio Grande Blvd. NW. The public is invited to attend, but RSVP’s are required. Tickets are $20 per person. To RSVP and to purchase tickets, call the Alumni Relations Office at (505) 277-5808 or toll free (800) 258-6866. For a complete list of activities and advanced ticket sales call (505) 277-5808 or visit: Homecoming 2014: HOWL@125.